Signature : Oumi Kuni Taneyoshi. 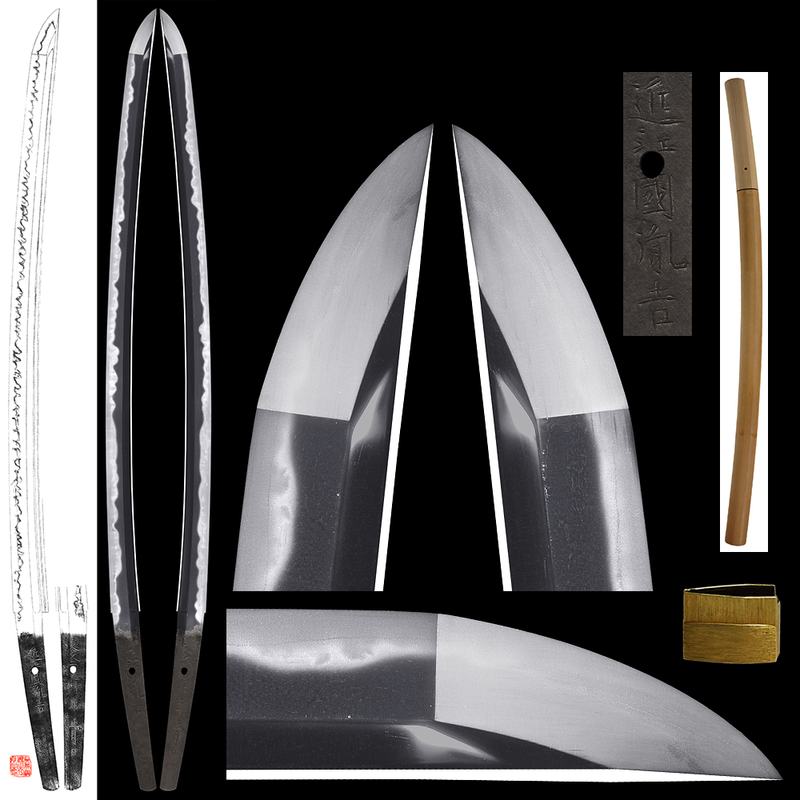 This sword Oumi Kuni Taneyosh belongs to Saijyo saku ranking. The blade was polished by hogh ranking polisher. Habaki :Gold foiled double habaki. Blade length :　60.60　cm or 23.85 inches. Width at the hamachi : 2.93cm or 1.15 inches. Width at the Kissaki : 2.36 cm or 0.92 inches. Kasane : 0.6cm or 0.23 inches. Shape : The blade is rather slall size sword length. on both sides of the blade. Boshi is oo-Kissaki style nice looking shape. Jigane :Itame hada well grained witrh Jinie attach and chikei work. there are many sunagashi and long kinsuji scatter. and studied under the Gassan Dadayosi and Taikei Naotane. but due to the Haito-rei, he must stop making swords. he became The Imperial Household Ministry order sword maker. But unfortunately he passed away after that Meiji 36 age 83. This blade is Sosyu den style bright and clear nice sunagashi long kinsuji. He studied making sword tecunique from Gassan Sadayoshi and also Naotane. The blade looks very similar with Taikei Naotane wonderful sword. This sosyu den sword remind us Kiyomaro. If Meiji government didin't issu Haito rei, he must be high ranking swordsmth. Anyway we recommend this wonderful top ranking sword for you. Saya :Kaeragi saya. (shark skin) very bright nice saya. Tsuba :On the round shape iron Tsuba, Kiku flower and leaves are endrave. Fuchikashira: Shakudo, dragon is engraved with gold color. Menuki : a dragon is engeaved with gold color. 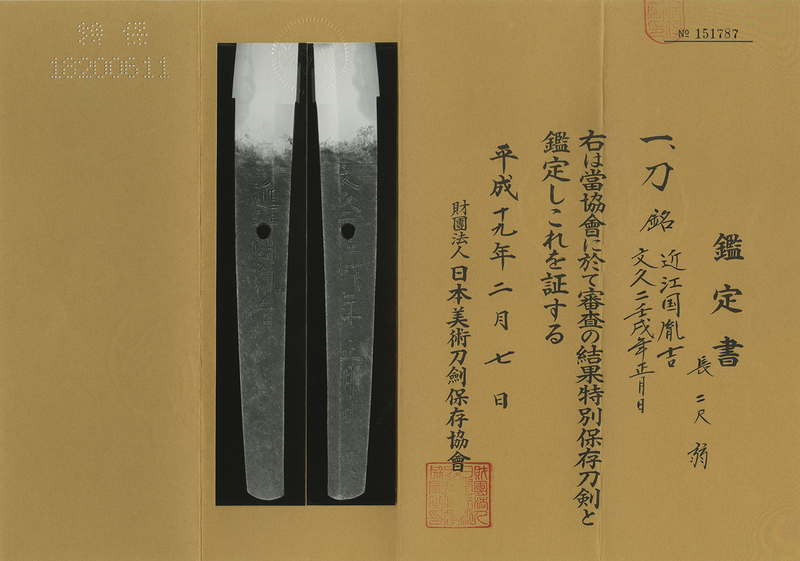 Katana:(Unsigned) attributed as Taira Takada school.